Not a lot of words today, working on several pieces from my river series again. These are like old friends and I'm enjoying working with the rich, darks that are so available in oil. Oils tend to reveal the movement of the brush so much more elegantly than acrylic. I think I have completed the forest piece, although it needs to sit for a while and it will let me know if it needs more attention or not. Ah the power of Spring, her incredible ability to return to life all that has been asleep, her sweet juices start flowing and growth and expansion return. All which was still starts to move and breathe again. I have cracked out the oils and their delicious buttery consistency is a welcome change from the acrylics. I needed a change, I was feeling oh so stuck again, this is a constant pattern of evolution. A period of tremendous discovery, passion and growth followed by a gradual slowing of energy and then that dreaded pause or inertia before the next discovery awakens the soul to further expansion again. I like the way the colours are speaking in this piece and I love the exposure of the roots. Trees are so miraculous in their dual connection to heaven and earth, a duality and tension of opposites that I find difficult to balance. I am in need of the trees solid roots at the moment so am grounding myself in their protective arms and the warming spring earth so filled with hope and promise after a long, lonely winter with only myself to contend with myself. I am learning self-love and it is not so easy as one might think. 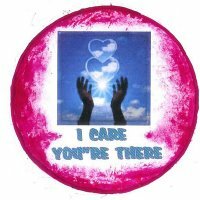 If I am able to be fully present for myself only then can I be fully present for another. I think my painting is helping me to learn this. There is a tension between the solitude and loneliness that I am living at the moment. This beautiful blessing by the late John O'Donahue was recently sent to me by a friend. that behind the facade of your life there is something beautiful, good and eternal happening. May you learn to see yourself with the same delight, pride and expectation with which God sees you in every moment. "Presence plays with form, fleeing and hiding as the sky does in water, now one place, now nowhere. What you thought to draw now lifts off the paper, as what you love slips from your heart." My Iphoto has been malfunctioning lately and giving me endless grief so I am unable to post new images at the moment. 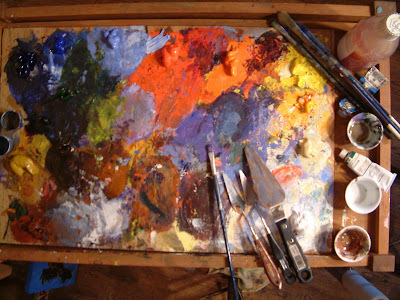 I am posting a photo of my old oil palette, not only because I find it beautiful but to inspire myself to get back to oil and leave the acrylics behind for a while. Oils are more luscious and delicious to work with, but also slower drying which is always a challenge for my impatient nature. I also find the colours deeper and richer, especially the darks so this post is a challenge to myself to break out the oils again. and interesting postings to peruse. Three Muses created from the previously posted watercolour sketches. I am in love with this new way of working, collage, glazing and playing with textures. I particularly love the way the landscape and rocks are managing to work their way in to the pieces. I LOVE painting, it really is so nonverbal and visceral for me at times, as if it is my lover! For several years I have been working on extra large canvases so these smaller pieces seem to create a more intimate portal for myself and the viewer. Now I need to get back in the studio and work/play! Too much time has been spent fixing broken things. 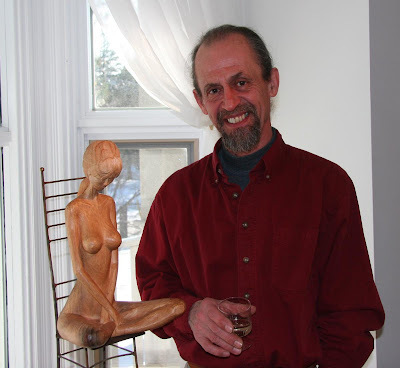 Here are some more images from the Eros show, this is my dear friend and sculptor, Luis Paniagua. 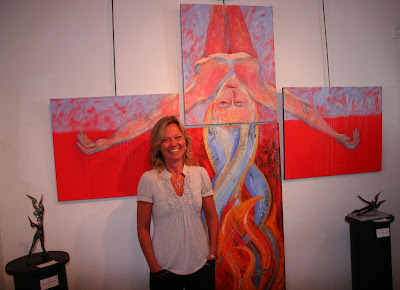 The piece in the middle, entitled Open Heart, is a collaboration between the two of us. The three pieces on top are in the entrance room of the gallery and are: The Return Dance of Persephone, Luis's sculpture and a graphite drawing by Margo Chick, I think the three of them together are a wonderful celebration of Eros. It's been a while since I've posted, lots going on, including computer break downs, grrr! This is an image of Descent of Persephone taken by a dear friend and supporter. The Eros exhibit was a beautiful collection of diverse works by 3 painters and 2 sculptors. We are all close friends yet had worked on our individual pieces separately so when we came together to hang the show it was a delightful surprise to see all our different interpretations of eros. I like working with a theme that takes one outside of the comfort zone and opens new directions in the work. 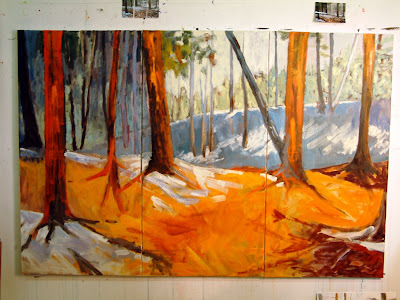 I am excited about integrating landscape and figure with collage and paint...back to the studio!